RocketTheme have released the complete Joomla theme. When I say complete, I mean complete in so much that when you download this theme you have a theme for JomSocial, K2 and phpBB3. 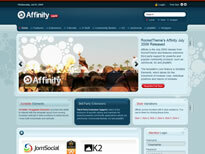 If you run a community site or you are looking at creating a community site, this theme just works. It comes with six preset styles but also the source files so you can pretty much do anything you want with it in terms of colours. It also comes with 35 module positions that the user can move about vertically and horizontally as well as in groups. If you don't know what I mean, go check out the demo of this as it really does take Joomla themes to a new height. Basically the user can control where all the modules go and in doing so they can decide to have the elements of the site just the way they want it.